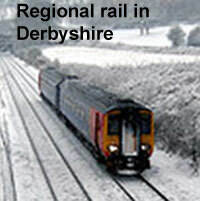 9 January 2012: Whilst mainland Europe leads on local and regional government commissioning of rail services, the UK leads on community engagement. In the last decade close to 30 community rail partnerships have been established across the less well-served areas of the country and 18 of these are now backed by designation within the Government’s 2005 community rail strategy. The regulatory background in Europe is interesting. In those countries where the rail sector is dominated by a large public corporation or corporations, regulation of these bodies tends to be light touch. In the UK, the more fragmented and much more private sector oriented system is subject to more prescriptive controls. This level of top down prescription has helped keep route and service closures to a minimum in the last 15 years but it has also led to service levels on rural and other less populous corridors being stuck at a minimal level. In contrast, in Germany, France and some other mainland Europe countries routes and services have been closed during this period. In the East and South-East of Europe this is significant. Successful community engagement depends on two prime factors  bringing together all those involved and evolving productive working alliances and the involvement of volunteers. Many in mainland Europe, notably Germany and Sweden, are sceptical that their citizens can embrace volunteering. Regional and local influence in France and Germany is predominantly exercised by the various layers of government through use of their money. They specify and largely pay for a lot of local and regional passenger rail services. In the UK, whilst local authorities have been essential to the development of community rail partnerships, the work on the ground is mostly done by co-ordinators and volunteers from local towns and villages who are passionate about the railway services and their rail stations. Sheila Dee is the Co-ordinator of the Chester-Wrexham-Shrewsbury Community Rail Partnership. Dee has both the opportunity and the challenge of straddling Wales and England. She says it is more positive than difficult because the devolved Wales government is strongly supportive of expanding rail provision. That said, Dee and her colleagues have achieved the exponential growth in use of the line and stations despite the London based Department for Transport (DfT) having specified a no growth contract for services in Wales back in 2003. When the next contract process takes place in 2016, it will be managed by the Welsh Government and the specification is likely to be for very substantial increases in services. Faye Lambert is co-ordinator of the Crewe-Derby Community Rail Partnership. Lambert has 34 volunteers and whilst much of their time is spent on station gardening and tidying and on promoting use of the service they are also part of successful open days at stations where they work with rail industry staff and others and with supporting school activities at stations. Most of the stations on community rail lines have periodic displays of artwork by school students and some also have professional artwork installed following fundraising by the partnerships. Gardening is key to winning awards, which bring positive publicity. Chirk near Wrexham won awards in both the Wales in Bloom and in the Britain in Bloom contests in 2011. Dee says the judges for Britain in Bloom arrived by train this year and commented on the appearance of the station as being a key part of the town’s success in winning a Silver Gilt award. Blythe Bridge and Kidsgrove on the Crewe-Derby partnership beat have both won best station of the year awards from the franchisee East Midlands Trains and the partnership has also figured in the annual community rail awards run by their national organisation the Association of Community Rail Partnerships. Progress on the Crewe-Derby line has been such that Kidsgrove is now the fastest growing revenue generator of in the Stagecoach-owned East Midlands Trains area/franchise. Numbers using the station rose by 70 per cent in 2010. It was recognised in two categories at the ACORP awards. Unusually for a community rail partnership station, it does have more than one route but the positive influence of the partnership can also be seen at calling points which have just a basic hourly service on a single corridor. Usage at Alsager station in the Cheshire East local authority area is up 90 per cent since 2007 and Blythe Bridge in Staffordshire was up 23 per cent in 2011. The attractive condition of the location is surely a key factor. That is because of the volunteers. They would not be there without all elements coming together to make the best of the railway resource. Chirk and Ruabon are both close to the World Heritage Site at Pontcysllte and also to the almost as brilliant Chirk Viaduct also by Thomas Telford. Ruabon has increased passenger numbers by 40 per cent since 2007, Dee is confident this will continue as the partnership was instrumental in securing re-routing of bus services to call at the station. Rail users can now interchange with bus services on a turn up and go basis. Visitor attractions are key in line promotion and partnerships negotiate favourable deals for train users. On the Crewe-Derby line they have an arrangement with the Alton Towers theme park. Sheila Dee says the activity of the partnership has changed the travel culture in the Wrexham area in the last ten years. “ We used to be very car based and now we are not,” she says..
Neil Buxton says emphatically. Community Engagement works. We have come further in the last ten years than many could have imagined. We can now aspire to an even more significant role.” Buxton foresees the partnerships spinning off social enterprises some of them potentially as commercial tenants of under utilised buildings and space either within or adjacent to the railway station footprint. ACORP has built up considerable experience with Station Adoption schemes, which are a feature of many partnerships activities already. With the site managers on board and the respect of the whole industry the CRP’s may be sought after tenants. 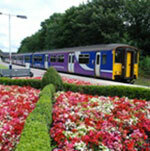 Buxton cites a successful initiative at Skipton station near Leeds by the Friends of the Settle-Carlisle Line as an example. They run a cafe at the station. In a 2011 publication the Association of Train Operating Companies usefully grouped together passenger numbers over the five previous years at the ten best performing community rail designated routes. All had achieved passenger significant increases. The really impressive thing is that some of these have been with services, which have not changed or improved only slightly. Persuading the centralised government departments and agencies responsible for running the network to implement different regimes especially on safety in order to contain costs will be a difficult challenge. But the rewards go way beyond reduced fixed costs. The potential exists for fit for purpose vehicles and even, in some cases, of minor infrastructure improvements, which could include moving stations to better sites and would certainly make hourly clock face services more realisable. 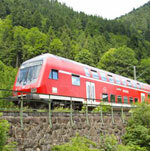 A lesson which the rail industry and the tiers of government which pay them and then largely leave them to their own devices across mainland Europe can learn is that in the UK rural and suburban populations are being won back to sustainable travel despite having to use track and vehicles which are not fit for purpose. Across much of less populous Europe investments have been made on these in the last 20 years. Governments  central, regional and local - might get more bang for their bucks if they stimulated a more active and informed ridership and population. Madrid has Europe’s fastest growing metro and urban rail systems. The size of the metro has doubled during the past fifteen years. Strong political leadership at city and regional level ensured a series of investment plans were funded and delivered. By mid-2011 the system had grown to 294 km of route on 12 lines with 296 stations and now is the sixth-longest metro railway in the world.